Taking advantage of Fujifilm's vast history in traditional film-based photography, the X-T20 integrates several Film Simulation modes, which can be used for photos or videos, to mimic the look and feel of some of Fujifilm's classic film types. A refined Classic Chrome mode is designed to deliver muted tones and a deep color reproduction, similar to that of a dated slide film. Pulling from their more contemporary line of transparency films, Provia offers natural-looking tones for everyday shooting, Velvia produces a more dramatic and rich tonality with deeper color saturation, and Astia gives less contrast for a softer depiction of skin tones. Mimicking their negative films, Pro Neg. Std. gives smooth image tones that are suitable for accurate color renditions, while Pro Neg. Hi produces a more dramatic feel with the ability to draw color out of a variety of lighting conditions. In addition to the colorful benefits of these Film Simulation modes, there are also monochrome modes that simulate the look of traditional yellow, green, and red black and white contrast filters, as well as an Acros mode that can also be paired with colored filter effects. A sepia mode is also available for producing an inherently nostalgic look. 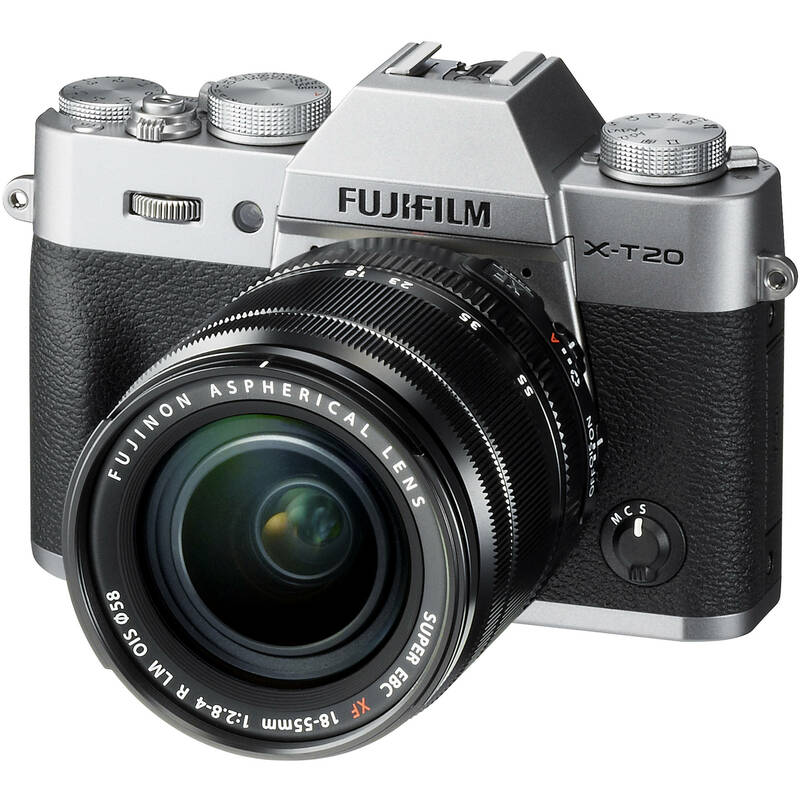 X-T20 Mirrorless Digital Camera with 18-55mm Lens (Silver) is rated 4.7 out of 5 by 95. Rated 5 out of 5 by Hansel-Gretel from Excellent camera This is a fine instrument...perhaps not quite as satisfactory as the X-T2 would be, but more than adequate for a serious amateur, especially for a travel camera. Like all contemporary cameras, this tool is essentially a complex computer. and presents the new owner with all of the challenges that changing to a different computer system poses. I'm looking forward to the day when it will be as Intuitively easy for me to use as my computer is. I'm surprised that more authors haven't jumped into the opportunity to write a book on the X-t20, decoding and helping new users. There surely must be a market here. Rated 5 out of 5 by Judi from LOVE IT! Having never bought Fujifilm products before, and new to mirrorless world (a friend does have a Sony), I researched before buying this. I didn't like hunting in menus that sony required. This camera has easy to reach buttons and the shots are crisp and colorful. Loving it and SO glad I waited for this to come back in stock to buy it!! It was worth the wait. Its small, light and compact. I love the look of the old fashioned silver and black. Just am 100% happy with it so far. Worth it to read the manual and find out what this little powerhouse is able to do. Or put it on auto and shoot. But I like photography and knowing what I paid for. This has delivered every time. Highly recommend. Rated 5 out of 5 by Dennis from Exceptional picture quality I bought this to use with the lenses I have for my X-Pro1, and enjoying it immensely. I take photos at local car shows and being in my 70s and with a bad back I was having problems getting shots at a lower point of view with my X-Pro 1. The tilting LCD monitor on the X-T20 makes such photos much easier. I'm still getting used to the touch screen, which I believe I will really use a lot in the future. The small body and buttons on the camera take a little getting used to, but I don't see any major problems. All in all it is what I expected from reading the reviews and am very happy with the camera and the very superb picture quality. I might consider getting a grip for it, but for now I really like the light weight and small size. Rated 5 out of 5 by Ted from Absolutely I use this camera a travel and vacation camera but the quality so far may prove this camera to be adapt at just about anything you want to shoot. The operation of the camera is somewhat different than other cameras as it has no P, A, S or M modes. Regardless the camera is easy to operate and the menus are not difficult to navigate. I have started with the 18-55 lens and found it to be an excellent performer in a multitude of shooting situations. JPEG images straight out of the camera are excellent with vibrant colors, great dynamic range and nice detail even with the kit lens. Hand held in low light this camera is awesome compared to my Nikon D7000. I have had great shots in low light, hand held at 1/35th second. Rated 5 out of 5 by fritz from Superb Image Quality! Superb IQ for this small camera! I have seen some negative reports about the quality of the body mainly the levers and dials. This is not true - if you want a small light camera but with all the whistles and bells of a large full frame digital camera, than these features are proportional smaller as well. I own a Nikon D800, the weight is almost 5 pound when the 16-35mm lens is mounted compared to the X-T20's little more than 1 pound with the 16-50mm lens attached. Rated 5 out of 5 by Anonymous from Absolutely fantastic camera!! Read any review and you'll get the same conclusion: The x-t20 is the same image quality and near same feature set as x-T2, but for much less. Those things that it does lack from the X-T2, like weather sealing, are deal breakers for some. But if you can live without those things the X-T20 offers a lot for the price. Most importantly, it's just a really fun camera to use!!! That's what I love about FujiFilm is that they make cameras that make you want to go out and shoot them as much as possible. If you're looking at the X-T20, just get it, you'll love it! Rated 5 out of 5 by I Sandoval from Smitten This camera along with the x system lenses has me really enjoying photography lately. I also have a Sony a6500 and that thing might be going up for sale soon. The Fujifilm camera is so much more fun to use. The image quality is delightful and I don't see a reason to not buy one if you enjoy photography. I'm fairly new to it, but I've tried a lot of different gear and this takes the cake. It's a keeper. If it is shipped to Hong Kong, would it be covered with international warranty? Yes, the international warranty (squaretrade) covers you in Hong Kong. Actually that lens is manufactured in their Chinese facility. Will the warranty valid in Canada?Is the Russian menu and what version of firmware? Unfortunately, the warranty provided with the camera is valid in the United States. There is a Russian language option in the camera. Our current stock would reflect firmware version 2.00. Will the Lensmate thumbrest for the T10 fit the T20? B&amp;H does not sell Lensmate products so we cannot verify if that will work or not. Try Lensmate directly. Interesting looking hybrid. What, if any, flat picture profiles are integrated for better color grading of video in post? Thanks! There is not a flat profile but you can decrease contrast and saturation to achieve a flat profile. Previous answers sate that the kit lens is made in the Philippines, China and Japan? Which of these is true? The 18-55 is made in Japan. The 16-50 is made in Phillipines. wil my x-a2 batteries work with with this camera? Is the XF55-200mm lens too big for this camera?